• For quantitative determination of nitric oxide (nitrate/nitrite) and evaluation of drug effects on its metabolism. • Sensitive and accurate. Detection range 0.6 - 200 μM in 96-well plate. • Rapid and reliable. Using an optimized VCl3 reagent, the time required for reduction of nitrate (NO3-) to nitrite (NO2-) is 10 min at 60°C. • Simple and high-throughput. The procedure involves mixing sample with three reagents, incubation for 10 min at 60°C and reading the optical density. Can be readily automated to measure thousands of samples per day. • Nitric oxide (NO) is a reactive radical that plays an important role in many key physiological functions. NO, an oxidation product of arginine by nitric oxide synthase, is involved in host defense and development, activation of regulatory proteins and direct covalent interaction with functional biomolecules. Simple, direct and automation-ready procedures for measuring NO are becoming popular in Research and Drug Discovery. 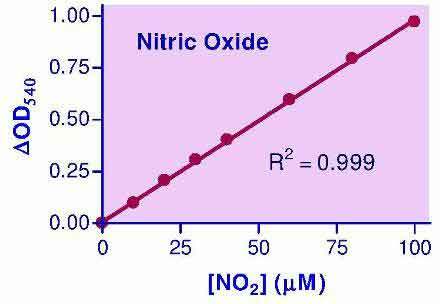 Since NO is oxidized to nitrite and nitrate, it is common practice to quantitate total NO2-/NO3- as a measure for NO level. BioAssay Systems QuantiChrom™ Nitric Oxide Assay Kit is designed to accurately measure NO production following reduction of nitrate to nitrite using improved Griess method. The procedure is simple and the time required for sample pretreatment and assay is reduced to as short as 30 min. 1. If I collect 150 µL cell culture medium and proceed to deproteination, should I prepare the standards in culture medium, instead of water? I am afraid that the pink color medium may interfere with the colorimetric assay. The medium is initially pink in color, after consumption by cells, it turns yellowish. How about blank? The assay reagents are acidic, and phenol red (the pink color in the medium) absorbs only weakly at 540 nm under acidic conditions. Although there will be a small background signal caused by phenol red, because this is a kinetic assay, and only the increase in OD is being measured, phenol red in the sample will not affect the measurement. However, I would still recommend preparing the standard in medium, because many common media contain nitrate to various degrees. It is essential to use a medium that contains a low amount of nitrate. Some media contain large amounts of nitrate (e.g. RPMI-1640) which make them incompatible with our assay. Others (e.g. DMEM) contain only low levels of nitrate and do not interfere. Please check with the medium manufacturer that the nitrate concentration is compatible with the nitric oxide assay. 2. How do I prepare the “100 µL sample” mentioned in step 2 if I work with cells? Could it be intact cells suspended in 100 ml cell media? Do I need to lyse the cells first? How do I trap NO? Nitric oxide is rapidly degraded into nitrite and nitrate, which equilibrate into the media. Users typically take the cell culture supernatant to measure nitric oxide production. Cell culture medium samples have to be deproteinated before the assay. 3. What is the best way to prepare the sample for NO Assay from renal tissue (cortex or medulla); and what buffer would be appropriate for homogenization? Do you think that supernatants from 100,000 x g spin are useful samples for this assay? Tissue samples can be homogenized in PBS (pH 7.4). After the homogenization, centrifuge the samples 10 minutes at 10,000 g (or higher) to remove debris and collect the clear supernatant. After deproteinating the supernatant, the sample can be used in the assay. 1. Bolander, FF. (2005). The compartmentalization of prolactin signaling in the mouse mammary gland. Mol Cell Endocrinol. 245(1-2):105-10. Assay: Nitric Oxide in Mouse mammary cells (Pubmed). 2. Carrero, Y et al (2009). Increased vascular endothelial growth factor expression, CD3-positive cell infiltration, and oxidative stress in premalignant lesions of the cervix. Cancer 115(16):3680-8. Assay: Nitric Oxide in Human cervix, serum (Pubmed). 3. Zeng, Q et al (2011). Control of Cervicovaginal HPV-16 E7-Expressing Tumors by the Combination of Therapeutic HPV Vaccination and Vascular Disrupting Agents. Hum Gene Ther. 22(7):809-19. Assay: Nitric Oxide in Human tissue (Pubmed). 4. Bulau, P et al (2007). Analysis of methylarginine metabolism in the cardiovascular system identifies the lung as a major source of ADMA. Am J Physiol Lung Cell Mol Physiol. 292(1):L18-24. Assay: Nitric Oxide in Mouse tissue (Pubmed). 5. Smith, MJ et al (2009). In vitro evaluations of innate and acquired immune responses to electrospun polydioxanone-elastin blends. Biomaterials 30(2):149-59. Assay: Nitric Oxide in Mouse cells (Pubmed). 6. Ying, WZ et al (2008). Dietary salt activates an endothelial proline-rich tyrosine kinase 2/c-Src/phosphatidylinositol 3-kinase complex to promote endothelial nitric oxide synthase phosphorylation. Hypertension 52(6):1134-41. Assay: Nitric Oxide in Rat urine (Pubmed). 7. Deshmukh, SH et al (2009). Ranolazine improves endothelial function in patients with stable coronary artery disease. Coron Artery Dis. 20(5):343-7. Assay: Nitric Oxide in Human tissue (Pubmed). 8. Rahman, MM et al (2009). Endogenous n-3 fatty acids protect ovariectomy induced bone loss by attenuating osteoclastogenesis. J Cell Mol Med. 13(8B):1833-44. Assay: Nitric Oxide in Mouse bone marrow (Pubmed). 9. Levy, H et al (2010). Characterization of brain lesions in a mouse model of progressive multiple sclerosis. Exp Neurol. 226(1):148-58. Assay: Nitric Oxide in Mouse tissue (Pubmed). 10. Hasegawa, K et al (2007). Role of asymmetric dimethylarginine in vascular injury in transgenic mice overexpressing dimethylarginie dimethylaminohydrolase 2. Circ Res. 101(2):e2-10. Assay: Nitric Oxide in Mouse tissue extracts (Pubmed). 11. Lipari, CW et al (2009). Nitric oxide metabolite production in the human preimplantation embryo and successful blastocyst formation. Fertil Steril. 91(4 Suppl):1316-8. Assay: Nitric Oxide in Human tissue culture (Pubmed). 12. Wang, SH et al (2008). Decreased inflammatory response in Toll-like receptor 2 knockout mice is associated with exacerbated Pneumocystis pneumonia. Microbes Infect. 10(4):334-41. Assay: Nitric Oxide in Mouse BALF (Pubmed). 13. Patel, SR et al (2008). Pioglitazone increases adiponectin levels in nondiabetic patients with coronary artery disease. Coron Artery Dis.19(5):349-53. Assay: Nitric Oxide in Human tissue (Pubmed). 14. Neuschmelting, V et al (2009). Elevated level of endothelin-1 in cerebrospinal fluid and lack of nitric oxide in basilar arterial plasma associated with cerebral vasospasm after subarachnoid haemorrhage in rabbits. Acta Neurochir (Wien) 151(7):795-801. Assay: Nitric Oxide in Rabbit cerebral arterial plasma, cerebrospinal fluid (Pubmed). 15. Smith, MJ et al (2010). Modulation of murine innate and acquired immune responses following in vitro exposure to electrospun blends of collagen and polydioxanone. J Biomed Mater Res A. 93(2):793-806. Assay: Nitric Oxide in Mouse tissue (Pubmed). 16. Levy, A et al (2010). Increment of interleukin 6, tumour necrosis factor alpha, nitric oxide, C-reactive protein and apoptosis in dengue. Trans R Soc Trop Med Hyg. 104(1):16-23. Assay: Nitric Oxide in Human fluid, tissue, cells (Pubmed). 17. Jawed, H et al (2010). N-(2-hydroxy phenyl) acetamide inhibits inflammation-related cytokines and ROS in adjuvant-induced arthritic (AIA) rats. Int Immunopharmacol. 10(8):900-5. Assay: Nitric Oxide in Rat serum, plasma (Pubmed). 18. Alonso, F et al (2010). Loss of connexin40 is associated with decreased endothelium-dependent relaxations and eNOS levels in the mouse aorta. Am J Physiol Heart Circ Physiol. 299(5):H1365-73. Assay: Nitric Oxide in Mouse aorta (Pubmed). 19. Farfara, D et al (2011). γ-Secretase component presenilin is important for microglia β-amyloid clearance. Ann Neurol. 69(1):170-80. Assay: Nitric Oxide in Mouse tissue culture (Pubmed). 20. Labib, HM et al (2010). The Role of Oxidative Stress Markers and Nitric Oxide Levels in the Pathogenesis of Glaucoma. Austr. J. Basic and Applied Sci 4(8): 3553-3558. Assay: Nitric Oxide in Human blood (Pubmed). 21. Lipari et al (2011). ASSAY OF NITRIC OXIDE METABOLITES IN THE CULTURE MEDIA OF HUMAN PREIMPLANTATION EMBRYOS. Assay: Nitric Oxide in Human tissue culture (Pubmed).